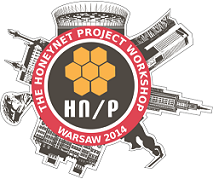 The 2014 Honeynet Project Workshop is organized by the Honeynet Project and coordinating with CERT Polska under NASK, held in The Adgar Plaza Conference Center in Warsaw, Poland from 12-14 May 2014. The workshop is a 3-day event to bring together top information security experts from around the globe to present their research efforts as well as discuss insights and strategies to combat new emerging threats through briefing sessions along with live demonstrations and hands-on training in state-of-the-art tools and techniques. The first day is a one-day set of briefing, beginning with a keynote and followed by various talks by world-class speakers from he Honeynet Project and invited top keynote speakers from famous security companies. At the end of this day, there will be post-session networking event to facilitate further discussions among attendees and participants. Briefings continue in the morning. In addition, this year we will bring out 8 real demonstration sessions to demonstrate our mature projects and tools that have been developed by Project members. These sessions give workshop participants the opportunity to see the software tools used and explained live, often by the actual authors of the tool. This is a rare opportunity to learn how to apply these free, valuable tools from the developers themselves as well as ask technical questions and gain insight into future developments for these tools and projects. Hands-on training opportunities will be offered on a number of topics, running at 4 concurrent classes. The Honeynet Project ensures that training courses meet the highest expectations and levels of professionalism. So join us in Warsaw for attending the high quality and challenging workshop to learn new, practical security skills to tackle emerging threats.